Could my child still have a vision problem even if they see 20/20? Parents often have a hard time understanding why their child struggles with reading and learning. Their child may have a hard time recalling words, losing their place when they read, confusing letters such as “b’s” for “d’s”, and have poor handwriting, reading comprehension, and spelling abilities. Parents may question whether their child has a learning disability or dyslexia, and choose to approach a pediatrician. What if a child with an IPP/IEP also has a vision problem? This will likely pose a risk to how effectively the child will respond to their IPP/IEP. 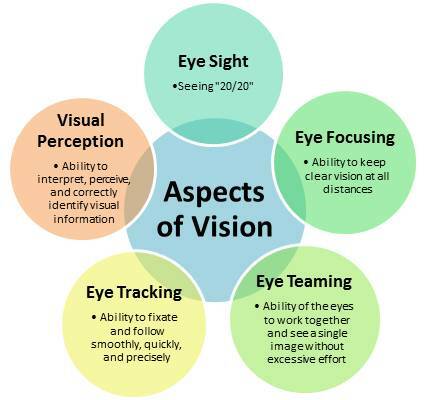 Visual screenings (eye sight screenings) at school and medical offices may not be enough to discover these vision problems since a child with an eye sight better than 20/40 pass and do not get referred off to an optometrist. So, an exam with a primary eye care practitioner and perhaps even a developmental optometrist may need to be made in order to be sure that the eyes are functioning well enough for the child to progress with their IEP. In fact, recent research showed that 67% of Canadian children (6-12 years old) in IEP, had an eye-teaming deficit, hindering their ability to stay focus while engaged in near work. Reference: Christian, L., Peddle, A., Pennifold, S., Schellenberg, B. (2012, October). Binocular Anomalies in Elementary School Children with Reading Problems: preliminary results from the University of Waterloo School of Optometry and Vision Science, External Pediatrics Clinic. Research presentation at the 42nd Annual COVD Meeting, Fort Worth, TX. Common signs of a vision problem include losing place while reading, headaches/strain around the eyes, and avoidance of visual tasks. If the student is struggling academically or acting out inappropriately in the classroom, a potential vision problem needs to be ruled out. What should your child do first? Vision therapy or tutoring? According to research,it may be "harmful to teach academic skills to children who have not yet developed the requisite motivational and intellectual foundation." This is why hourso f tutoring do not help children with an underlying vision and visual pereceptual problem. Visino therapyrehabilitation may be required first. We actually see with our brain, not our eyes! Read more about: How do we see?